Considering the newspaper model, a post can be thought of as essentially one article. It is written and published at a given point in time about a particular subject in a specific category and posted on a certain page. The sports page, for example may contain several posts from the sports category. Posts are primarily written as part of a blog (web based log of events - or journal). However posts have multiple functions and using them creatively can give you greater control over the management of your websites content. Posts belong to one or more categories and can be sorted and displayed in all sorts of ways on your website. Examples of posts on your website might include press releases, product fact sheets, general news articles and blog entries. 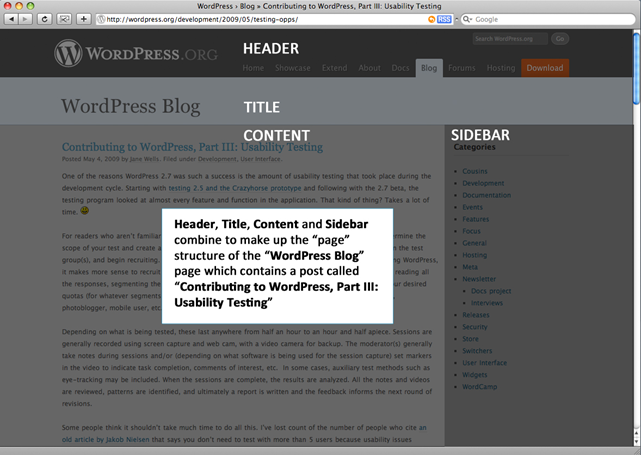 Technical: Posts can live on pages – in the main content area. Pages cannot live on posts. 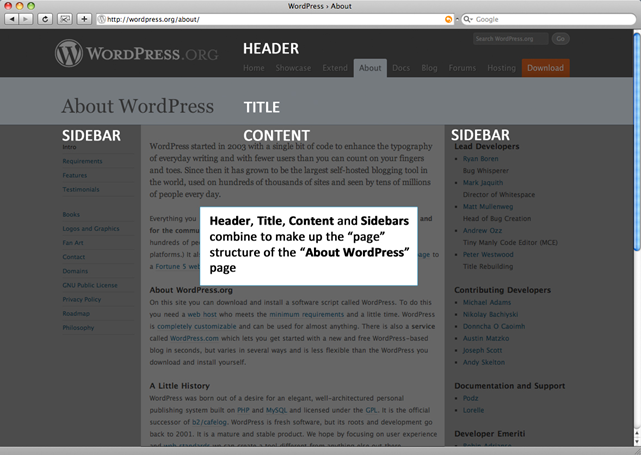 The following screenshots may help to explain the difference between a page and a post. If you are updating your site or adding content on a regular basis, it is more than likely you will be using posts. NB: If you are still unsure about whether or not to use a page or a post for your content, consult your web developer or IT department. Now that you have an understanding of the difference between a page and a post, let's look at how to edit existing content or add new content. We're going to start off easy by editing an existing page to get you familiar with the tools you need to use.